We set the alarm this morning so we could be on the beach by 8 AM for Marijana’s yoga class. It was already hot and I spent half of the class under my towel. Marijana worked a mindfulness theme about taking the time to enjoy the moment. She said when you are thirteen you can’t wait to be fourteen but if are sixty four you are in no hurry to turn sixty five. English is not her first lanquage so she had cute way of urging us to let go of time. She didn’t exactly say “let go” but I can’t remember what she said. I made a point to remember it but now it is gone. We all went swimming in the lake after class. We read the paper down at pool and then visited our neighbor, Sue, who has been tending to Monarch butterflies. She spots the butterfly eggs on the bottom of the milkweed plants and brings those portions of the plants to the netted cage on her porch. 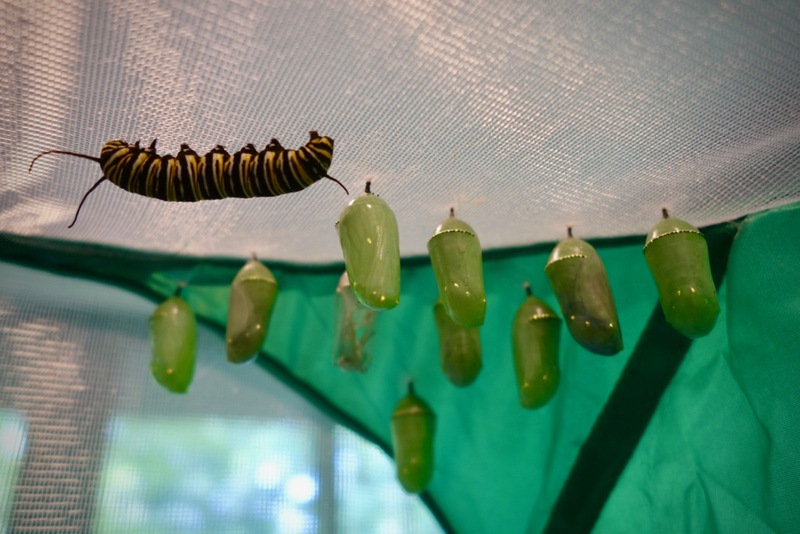 The eggs turn into small caterpillars who eat the eggshell and then the leaves of the plant until they get big at which point they crawl to the top of the cage and curl up into a pupa. That thing stays green and then turns clear enough for you to see the butterfly inside all curled up. They drop out of the pupa and Sue releases them. If it isn’t a miracle it is pretty close.